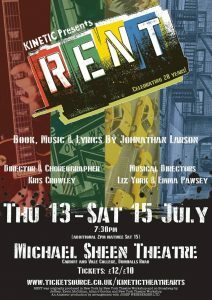 Jonathan Larson’s AIDS-themed urban rock musical Rent is back on stage, directed and choreographed by Kris Crowley and performed by a strong, young cast belting out the numbers as if their lives depend on it. Even though it was written 20 years ago, AIDS feels all the more relevant and a crucial theme to be covered now. The musical follows a gang of artists who struggle to maintain relationships and conforming to society. They soon decide to face the music, which leads to self-discovery and hope. Their rendition of ‘Seasons of Love’, instantly gives us goosebumps and challenges our own perception of mortality. The characters are what made the show what it was. James Evans stood out, offering a raw, heart-wrenching performance that was not short of emotion. Another stand-out performance was from Thomas Price who played the role of Angel – his stage presence was engaging and truly graceful. Joanne, played by Jade Wellbeloved, and Maureen, by Grace Morrison, were both powerhouses, and made a stunning showcase. The remainder of the cast offered much energy, bringing smiles and giggles to the lips of the audience. A wordy musical, act one particularly could do with a touch of editing, but this is nonetheless overridden by the strong ensemble pieces and well thought out character development. Bravo, Kinetic Theatre Arts!